But Kinsey plans to make the most of her new position with the Mayor of Chicago, at least until she decides what she wants to do next — make a name for herself in Chicago or return home to California. As the new man on the Mayor’s team, Kinsey is still suffering under the burden of fluff work but her current assignment might have change that. The men from the Fire Department and Police Departments recently became the newest YouTube sensations when they got into a brawl at a bar and it was watched over a millions times. Kinsey will be responsible to show that CFD and CPD can play nice together for the good of Chicago. 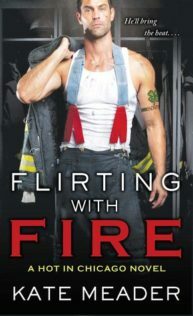 Fireman Luke Almeida, one of the Dempsey Clan, has no desire to make nice with the detective. These two hate each other and Luke would rather face the disciplinary committee than shake and make nice for the Mayor’s cameras. At least until Kinsey explains that if Luke doesn’t cooperate, the Mayor will have no problem removing him from the department. All the Dempsey’s work out of Engine Company 6 and Luke needs to be here to look out for his brothers and sister. Luke will have no choice but to play nice with the Mayor’s PR princess. As Luke and Kinsey work together and get to know each other, they find it harder and harder to separate work from pleasure but will crossing the line with Luke put Kinsey’s new job in jeopardy? The story of Kinsey and Luke wasn’t a bad read. There were moments where there was a real spark between the two but I did have issues with the way each character behaved at times. I liked the idea of the close family of adopted children, although it would be easier to believe six gorgeous children all muscled and built for work as firemen if they came from the same parents. I could understand that all the children would want to follow in the footsteps of the father figure that took them in and raised them, but that all the children from different parents all turned out to be gorgeous and built seems more an impossibility. None of the boys was scrawny with glasses? A computer geek vs. firefighter? The only girl, Alex, was beautiful and also wanted to be a firefighter? Rolling with that flaw, what drew me in here more than Luke and Kinsey was the siblings. I liked Alexandra who was a strong female character although her temper gets her in as much trouble as big brother, Luke. Alex is the focus of the second book and I am uncertain of her love interest, the Mayor of Chicago, because he was definitely sexist, whether it was toward female firefighters in general or his reactions were just Alex, we don’t know yet. I did like Alex enough to check out the next story. What interested me more than Alex was brother, Gage, and his story. Gage has always known he was homosexual and he is very confident in his attractiveness to others. He can have any man he desires but his hormones go into overdrive when he meets quiet and surly restaurant owner, Brady Smith. Gage wants nothing but to become Brady’s play toy but he can’t get a good read on whether Brady has any interest. Gage is frustrated and yet obsessed and drooling over Brady. Brady runs hot and cold and is definitely hiding some issues which may have something to do with his many scars and his time in Afghanistan. We are not 100 percent sure what is the deal with Brady. I have yet to reach the point of reading a M/M romance but have several series hinting at one going on with the secondary characters and all of them I want these men to have their HEA. 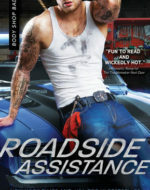 I wasn’t certain if we were going to get a actual story on Gage and Brady and I know the third book will be big brother Wyatt, but after checking once again with Goodread it appears that a novella, Melting Point, came out in August (which I must have missed) and I am going to Amazon right now to grab a copy. While the Kinsey and Luke story was not grabbing my interest, their siblings definitely were. I would say that you definitely want to read this story, if only to get to know vivacious brother Gage and his surly love interest. Another man had entered, wearing board shorts and a ripped CFD shirt, through which is extremely defined muscles play peekaboo. Tall and blond, with a fresh-faced Thor vibe, he looked like he’d stopped off at Engine 6 while on a break form his modeling gig for GQ. Truly, she must have missed the entrance to the hot-man laboratory on her way in. Boystown. Chicago’s gay neighborhood, which confirmed that Baby Thor played for the other team. The gorgeous ones always did, though in all honesty, it looked like there was gorgeous to spare. The other two members of the triple threat were still taking up all the sacae and sucking up all the oxygen.